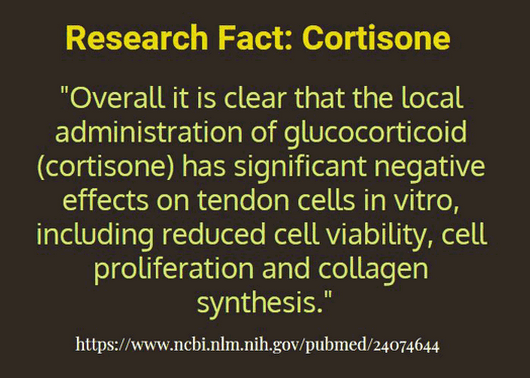 Can Cortisone Be Detrimental to Tendons? It is amazing that so many people only focus on short term options (like cortisone injections) to help overcome tendon-related issues. One will never overcome tendinosis or other forms of tendinopathy without focusing on treatments designed to remodel damaged tissues. Tendons are dense tissues and lack a strong supply of blood flow. This limits the amount of oxygen and nutrients reaching the tendon under normal circumstances, thereby limiting one's healing capacity. Hence, the longer term focus should be on nourishing injured tendons with a healthy supply of blood flow to help in rebuilding of the tissues.